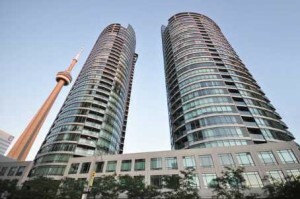 Spacious And Bright 1 Bedroom + Den Luxury Suite, Walk To Harbourfront And The Lake, Rogers Centre, C.N. Tower, And Air Canada Centre!! Approx. 650 Sq Ft With Floor To Ceiling Windows, And Stylish Decor, Featuring Upgraded Laminate Floors Through Out Liv/Din, Den And Bedroom. Like Hotel Living With State Of The Art Recreation Facilities. Spadina Line Subway Or Minutes To St. Patrick Subway Station. Fridge, Stove, Built In Dishwasher, Microwave, Fan Hood, Washer And Dryer. Light Fixtures And Window Coverings. $339,000 1 bedroom + den, 1 bathroom, and 1 parking space.